It is not clear how the town got its name but a reference is usually made to the eighteenth century Afghan conqueror, Ahmed Shah Abdali. The town has been mentioned by Mughal Emperor Jehangir in his memoirs and was frequently visited by successive Mughal Kings, on their way to Kashmir. One has to understand it; it was wonderful during Mughal period: Romantic, beautiful and quiet. One of the significant landmark of past in Hasan Abdal is a set of greatly spread red brick buildings immediately to the west of the Grand Trunk Road. These buildings belong to the Cadet College Hasan Abdal, Pakistan's foremost premier boarding institution. Field Marshal Muhammad Ayub Khan inaugurated the school in 1954. The main academic block overlooks the college with a cricket ground in the centre, called the Oval. Six residential wings surround the Oval and it is always a pleasing sight to see smart young boys in uniforms walking towards their academic block. The college has always been famous for its academic results with its students bagging most of the top positions in board examinations. While Aitchison College has for a long time catered to the political leadership of the country, the establishment has come from colleges like Cadet College Hasan Abdal and Lawrence College. One of the interesting facts regarding these colleges is the strong sense of comradeship and fraternity that prevails among the students. The boys of the Cadet College Hasan Abdal use word Abdalian with pride and pleasure. The Cadet College is surrounded by Loqat orchards, lush green fields and a gushing stream where a day with fishing rod can really be fruitful. Mr. Catchpole, the first principal of the College is also buried here. The other claim of the town to international fame is Sikh Gurdwara (temple) known as Panja Sahib having a rock with the hand print of their religious leader Baba Guru Nanak. 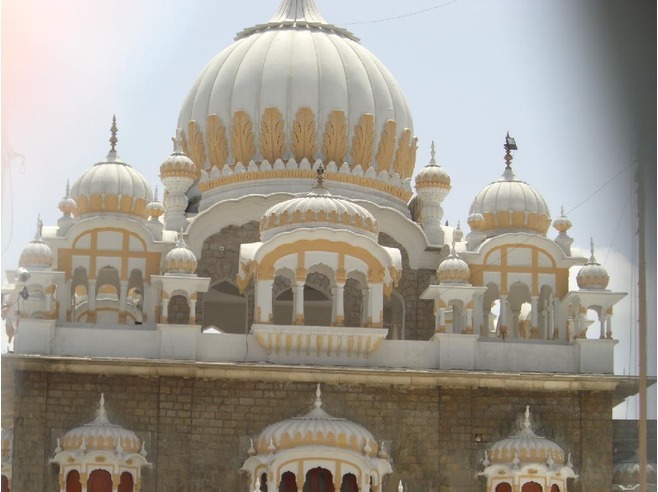 Twice a year, Sikh pilgrims visit this Gurdwara from all over the world. The legend has it that in 1521 AD, while passing through then deserted area on a very hot day, Guru Nanak's companion Bhai Mardana got very thirsty. The Guru suggested that he go to the Saint Baba Wali Qandhari who lived in a hut atop a nearby hill and ask for water. The Saint refused to give water from his well. Desperate with thirst, Mardana repeated his plea three times. Finally the saint reprimanded Mardana who returned to his guru and collapsed at his feet. The Guru asked him to pick up a stone. The disciple did as he was told, and water flowed from under the stone, while the Saint's well dried up. The Saint then pushed a large boulder from hilltop and sent it rolling towards the Guru and Mardana. But when the boulder reached them, the Guru stretched out his hand and stopped it with his palm. 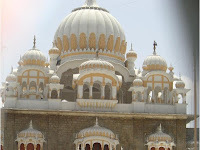 During Sikh rule, Hari Sing Nalva got the edifice of temple made at the place. Later, the temple was extended and a sarai (inn) was added for accommodation. The temple is typical of the rather florid Sikh style with gilded domes and cupolas and stands in the middle of a large water tank. Built with grey sandstone, its exterior is spotted with protruding domed bay windows. The central fluted dome is encircled by several symmetrically placed big and small domed kiosks. The cemented water tank derives its supply from a fresh water spring that emerges from underneath a huge rock. Now this huge rock has that famous hand print on it for which the site is known as 'Panja Sahib'. On the nearby hill, at an altitude of 714 meters, lies a meditation chamber of Saint Baba Wali Qandhari, popularly known as Baba Hasan Abdal. The saint stayed in Hasan Abdal from 1406-1416 AD but died and is buried in village Baba Wali near Qandhar (Afghanistan). The devotees and visitors climb over the steps leading to the hill, for offerings and to have a panoramic view of Hasan Abdal. Two other historical buildings of Mughal era (Muqbara Hakeeman and so-called tomb of Lala Rukh) are located just opposite the temple. Hasan Abdal is an interesting small town. I have known Hasan Abdal during my stay in Abbotabad. It is a neat little town, as pretty as a picture postcard. The town has a character of its own. Environment is tranquil, pollution free and quiet. One finds countless attractions spread around the town. And you can see (and have) lines of shops selling mutton karahi made in desi ghee side by side Peshawar fame chappal kabab along the G T Road near buss stop. Move away from the traffic hustle of the G T Road and what strikes you first is the emptiness. There is nothing much there, just air of a blue that is so attenuated that it is almost white. You stand anywhere and breathe in the dry air, feel the sun upon your neck. You are in Hasan Abdal suburbs; a countryside that is on the main road but still relatively only a few people visit. PS: Get off the Motorway at Burhan Interchange to go to Hasan Abdal and onward to Abbotabad.